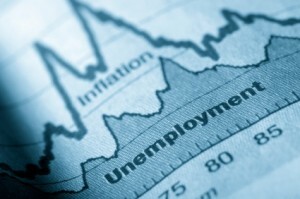 The widely anticipated September Unemployment Report covering the month of August was just released. Let’s dive right in and take a look at the numbers . . .
>>LD’s comments: higher than the expectation of 9.5%. Recall that the rate moved down last month from 9.5% to 9.4% as the labor pool shrunk. This move higher puts the rate back on the track it previously held and would project to a likely double digit unemployment rate in the 4th quarter. Where’s the stimulus? Where are the jobs? Bulls would say the employment situation is stabilizing. Pragmatists look at the numbers and see an economy settling in to a likely low growth path at best. The unemployment rate of 9.7% is the highest since 1983. The underemployment rate of 16.8% is very sobering!! >>LD’s comments: Close to consensus, but the prior two months had revisions showing further declines of 49k. (The prior month was revised from a loss of 247k jobs to 276k. July was revised from a loss of 443k jobs to 463k jobs). Manufacturing lost 63k jobs, government showed a loss of 18k jobs with more of these at the state level.I repeat my comments from above. We are not witnessing any inclination by private companies to start the rehiring process. As such, the likelihood of long term structural unemployment is growing. This fact will serve as a real drag on consumers in general and the economy as a whole. September: came in at .3 with the prior month revised to .3 as well. >>LD’s comments: Largely due to the increase in the minimum wage. Do not look at this increase as an indication of potential growth in retail sales. >>LD’s comments: as expected the average hourly workweek remained unchanged. This number, which remains mired at a level last seen in 1964, is an indication that an expected rebuild in inventories is not on the near term horizon. Further Color: the economy remains significantly challenged. Despite all of the government stimulus and government programs, in my opinion the economy is very vulnerable. Behind these numbers, the consumer is seeing few signs of improvement in the jobs space. That reality is impacting the sluggish retail sales along with the continued increase in delinquencies and defaults on the credit front. Market Reaction: futures have been bouncing up and down post-report. Prior to the report, equity futures indicated a slightly positive opening to the equity market. Now the futures are closer to unchanged. Interest rates have also bounced around, but the front end of the yield curve seems better bid as the unsettledness behind these numbers makes investors nervous. The dollar index is somewhat improved but not in a meaningful fashion. >> the economy remains challenged and will bump along the bottom. No “V” recovery, but more like the “caterpillar” designation assigned by our Sense on Cents Economic All-Star Bob Rodriguez. Get used to it because it is not going to change appreciably anytime soon. I repeat my market call from the other day in which I believe equities will retreat from current levels. Please track our work here at Sense on Cents via Twitter, Facebook, RSS feeds, or e-mail subscription. Visit and comment often! !